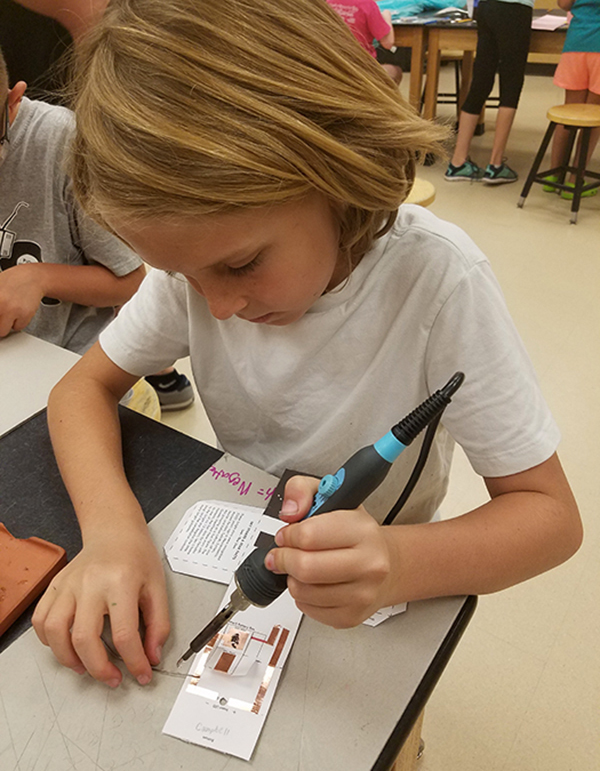 Watch the Instructional Slide Show below for step-by-step instructions for making you nightlight either with solder or conductive glue. Collect all materials. 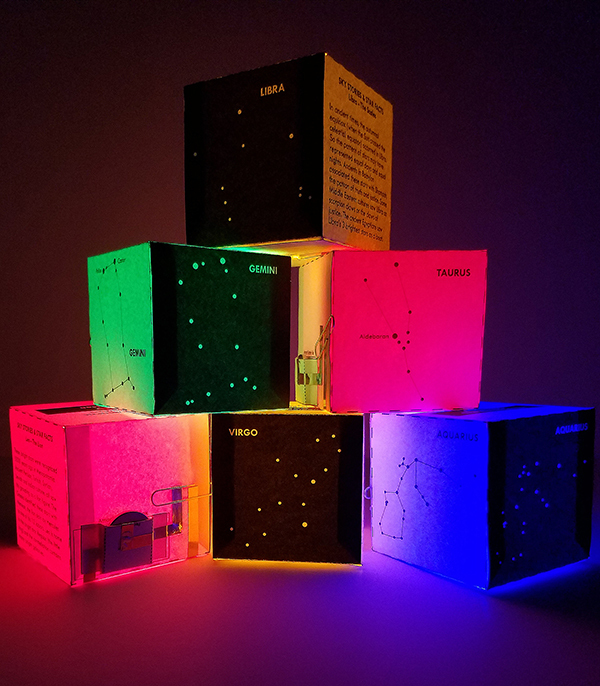 The Project Kit includes templates and technology for the 13 Zodiac Constellations. You will also need glue stick, hot glue, scissors, pencils, thumb tack, blue painters tape or reverse tweezers. If you need a soldering iron, we like an Adjustable Temperature Soldering Iron and Lead Free Solder. If you are not soldering, you can order Conductive Glue. Check out our gallery of project examples for inspiration. This project is fun for all ages - youth to adults! You can also order the extensive Project Guide booklet, for more detailed instructions, soldering station tips, resource links, PDF templates, supply planners and standards. Great for classroom teachers! Check out the Trouble-Shooting Tips below to test, evaluate and revise designs. Collect your template and copper tape. We recommend scoring with an embroidery needle and straight edge to get crispy folds. To score, line your straight edge up with a dashed line and run your needle along it to indent your paper. Score all dashed lines on the cube template. Score all dashed lines on the T-shaped battery box template. 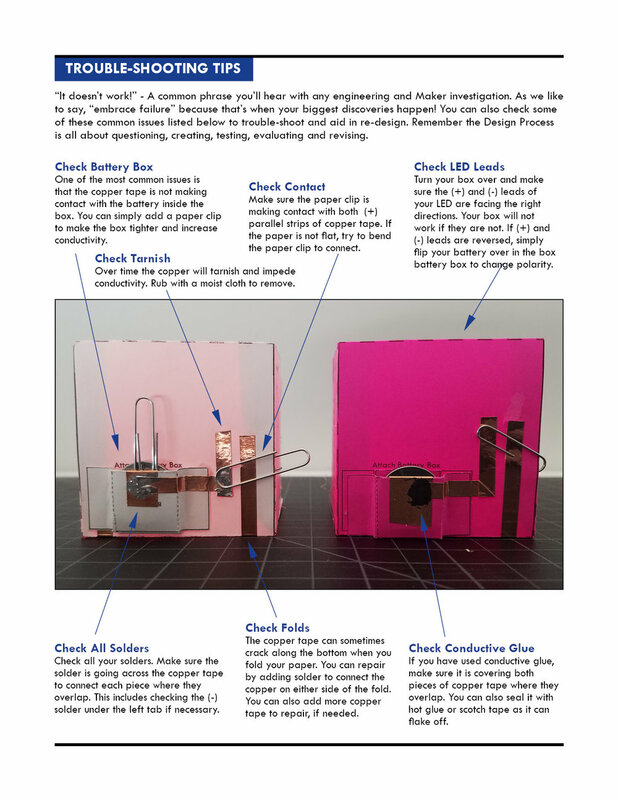 Cut out both your cube and battery box templates. Get a glue stick. Flip the battery box over to the non-printed side. We find it is helpful to mark the box with “Xs” and “Os” as shown to help with gluing. Place glue stick on the center panels. Fold over the ends to glue “X” to “X” and “O” to "O”. You have doubled the paper on each end to make your battery box stronger. Make sure you can see diagrams on both sides. Place glue stick on the battery box in the circle diagram. Press the glued panel to the circle on the cube template. The black lines on the inside of the battery and cube template should line up. Remove the backing from your 1/2” x 1/2” copper tape square. Stick it onto the black square diagram printed on the inside of your battery box. Place your 1/2” x 1 1/4” copper rectangle onto the red rectangle diagram on the inside of the battery box. Make sure no copper gets closed to the dashed fold line. Wrap the copper over the edge of the T-tab and onto the red diagram on the outside of the battery box. The take the energy from the (+) side of the battery inside the box to the outside tape circuit. Get your 1/4” copper strip and remove a bit of backing. Place it onto the copper square inside the battery box. Run it along the black lines for the (-) side of the circuit. Cut and overlap the copper at each corner. Check that the copper tape looks like this image. The 2 parallel (+) lines will make a gap for a paperclip switch. Get a popsicle stick. Rub the copper with a popsicle stick to burnish and smooth it. Make sure you copper overlaps at each corner and inside the battery box. Make sure your (+) and (-) lines do NOT touch. Punch a hole in the small circle that says “ Insert LED.” Make sure there is no copper in the hole. If you are using solder, solder along the (-) line where the copper overlaps - inside the battery box and at the 2 corners. Solder at the corner of your (+) line. You will finish the last (+) strip on the top of your battery box later, once you have glued it shut. If you cannot solder, apply conductive glue everywhere your copper tape overlaps - inside the battery box and on the 3 corners. Make sure the glue dries before continuing. Insert the battery into the battery box with the (-) side down. Fold over the T-tab and hold firmly. Lift a side paper tab and apply hot glue underneath. Press the tab down to secure. Glue the other tab and press it down to make sure your battery pocket is tight. Yes, you can place hot glue on top of the copper, it’s an insulator. Run you last (+) line from the copper rectangle on top of your battery box to the short parallel line. Do not connect the gap in the parallel lines. Make sure the copper tape overlaps. Insert your LED light through the hole from the interior (non-printed) side of the template. You can use a 10mm or 5mm light. Press the longer (+) lead on top of the (+) copper line. Press the shorter (-) lead on top of the (-) copper line. Secure with blue tape or reverse tweezers. Make sure the leads are facing the right direction! Place solder along the LEDs to secure them copper tape underneath. If for any reason you solder the leads reversed, you can flip the battery in the pocket to switch polarity. Solder where the copper tape overlaps on the outside of the battery box. Solder where the copper tape overlaps at the corner of your switch gap. Make sure no copper is inside the parallel lines. This is where you will insert your paperclip switch to close the gap. Test your light by using a piece of copper or paperclip to connect the 2 parallel lines. This closes the switch gap and allows energy to flow through your tape circuit. To close your box, fold each dotted line. Place hot glue on the tabs and connect to the corresponding cube face (side). Do NOT place hot glue on the tab where it says “paperclip”. Glue and secure each tab and watch your lantern tape shape. Glue the bottom face last by placing hot glue on the 3 connecting tabs. Insert a paperclip in the spot you did not glue. The paperclip will connect the parallel lines, closing the gap. Adjust the paperclip so it connects the gap and turns your LED on. If for any reason it is not working, check your circuit to figure out the issue and check out our Trouble-Shooting-Tips.